Jade v0.13.0 launches the new Masternode Proof of Stake [MNPoS] consensus system. MNPoS will kick in 2 weeks after the release, at block height 2.330.000. The network has time to update to v0.13.0 until block height 2.327.000. Old nodes will be cut off at 2.327.000. v0.13.0 also includes unique CRW prefixes. Once you update your client to v0.13.0 all your public addresses will automatically be converted to new ones with CRW prefixes. You can read more about CRW prefixes in the technical documentation of Crown Platform, chapter 5.3 or in Mark Brooker’s release notes on GitLab. If you are reading this, Crown has successfully released Crown Core v0.13.0. I have provided a fast read with the release notes and update instructions, followed by informations on the CRW prefixes, MNPoS, block reward changes and next development milestones. Crown Core Jade v0.13.0 features 2 main changes over the previous v0.12.5.x version. A total of 158 commits have been in place to make this release possible. The starring devs for this release have been Presstab (70 commits) as creator of the custom MNPoS solution and Ashot (62 commits) as Crown Core lead and supervisor. This shows an impressive engagement and coordination with a total of 6 developers involved in developing Jade. A massive shout out to defunctec and walkjivefly, who have been involved in testing during months! The full release notes are available on Gitlab, courtesy of Mark Brooker. Protocol version is changed to 70055. This release is mandatory for the whole network. Please always back up your wallet.dat before proceeding to update the client. When Crown originally forked from Bitcoin it retained the Bitcoin address format. Nowadays that is not a desirable legacy because it prevents use of Crown with hardware wallets such as Ledger and Trezor. Those devices cannot distinguish between different coins with the same address prefixes. v0.13.0 introduces new prefixes for both mainnet and testnet. These unique and distinctive prefixes will enable the use of Crown with hardware wallets. We hope to see the first integration soon. The change is largely friction-free from the user’s perspective. Once users update to v 0.13.0, they will be able to receive CRW sent to old addresses from old wallets. New wallets cannot send CRW to an old address. Old wallets cannot send CRW to a new address. If the equivalent new address of 15bj2HB2UbmjEZgXyEW4M8MhUL5TXGCN8L is CRWGZiLqSUbCTWkm3ABp5qpXdun2h8DJCKYF you can send CRW from the old wallet (v 0.12.5.3) using 15bj2HB2UbmjEZgXyEW4M8MhUL5TXGCN8L and from new one (v 0.13.0) using CRWGZiLqSUbCTWkm3ABp5qpXdun2h8DJCKYF. Both old and new wallets will be able to see the CRW! On 18th of July 2018, Crown announced that it had signed an agreement with Paddington Software Services to develop and implement a custom Masternode and Systemnode Proof of Stake consensus algorithm on Crown Core. Eight months later and due to a huge community effort funding, monitoring and testing the solution, the code is now ready and included in the Jade 0.13.0 release. At block height 2.330.000, on April 12th approximately, the first Proof of Stake block will be minted by either a Master- or a Systemnode, and the transition from auxpow to MNPoS will be complete. 5. Why is the Crown MNPoS system unique? The block reward distribution will change at block height 2.330.000, when MNPoS kicks in. This graphic explains the changes. On the left, reward distribution with PoW. 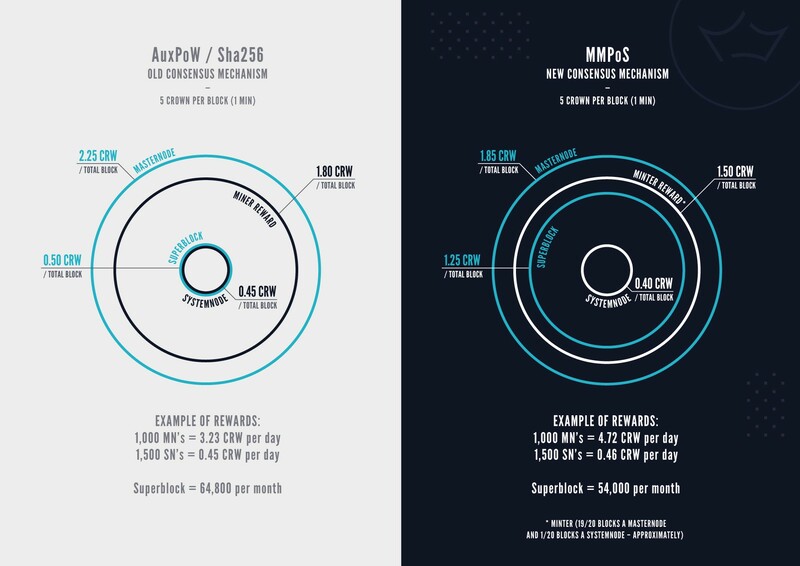 On the right, reward distribution with MNPoS — starting at block height 2.330.000. Jade is a huge milestone for the Crown project, but this is just the first of a series of releases that will lead to Crown Platform v1.0. The next release “Emerald” is just around the corner and will feature the Non-Fungible Token [NFT] framework. NFTs on Crown Platform are a functionality with unique charateristics designed and implemented by Artem. More information about NFTs on Crown Platform will be available during April. Thank you for your continued support of the Crown project!